Make up the strawberry swirled meringues and fruit puree the day before, then just layer with whipped cream and extra fruit in recycled jam jars and screw on the lids, take out to the garden in a basket or pack into a cool box for a picnic pud. Preheat the oven to 110oC (225oF), Gas Mark ¼. Line a large baking sheet with non-stick baking paper. Puree the strawberries and raspberries in a liquidiser or food processor then press through a sieve. Whisk the egg whites in a large clean dry bowl until they form stiff moist looking peaks and you feel confident that if the bowl was turned upside down the egg whites wouldn’t fall out! Gradually whisk in the sugar a teaspoonful at a time then continue whisking for a minute or two until really thick and glossy. Add 2 tablespoons of the berry puree then very briefly mix until marbled. Spoon into a large piping bag fitted with a 1.5cm (¾ inch) plain piping tube, pipe small rounds on to the lined baking sheet. Bake for 11/4-11/2 hours or until the meringues may be easily lifted off the paper. Lightly whip the cream until it forms soft swirls then fold in the fromage frais. 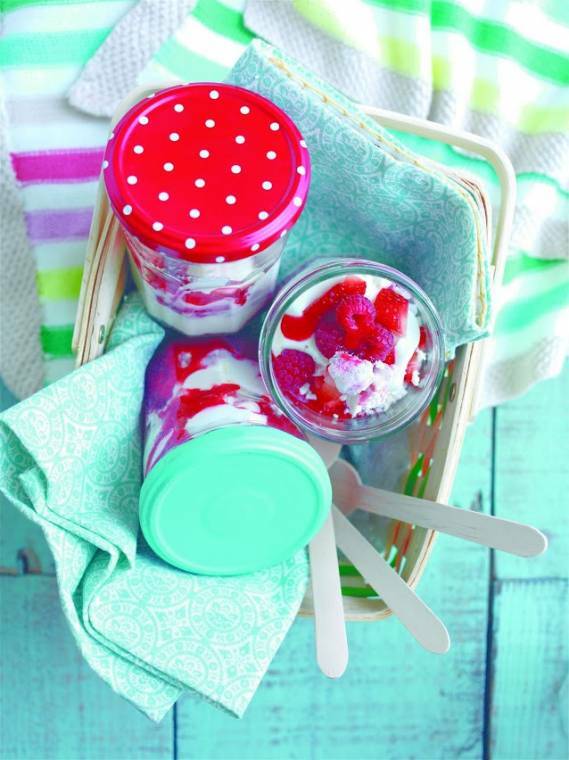 Crumble the meringues then layer in jam jars or plastic containers with the remaining berry puree and diced strawberries. Add the lids and keep in the fridge until ready to serve or transport to a picnic in a cool bag with a frozen ice block to keep them cold. Serve within 1½ hours or the meringues tend to lose their crunch. "24/06 Creative Mondays And Features…"
"Cosy Tights And Comfy Shoes For Windy Days…"